Of course, by 2001, Rhett Miller wasn’t the only high-profile alt-country bandleader who had turned his sights towards rock ‘n’ roll. Jeff Tweedy had been going in that direction since Being There and was to deconstruct everything on Yankee Hotel Foxtrot and Ryan Adams had been moving the doomed Whiskeytown away on the electic Pneumonia and of course, went full classic rock on Gold. In between was Rhett Miller, who followed up Fight Songs with the best record the Old 97’s ever made, 2001’s Satellite Rides, an album that wasn’t nearly as high profile as the news-hook records that both Tweedy and Adams made, but was equally as good. 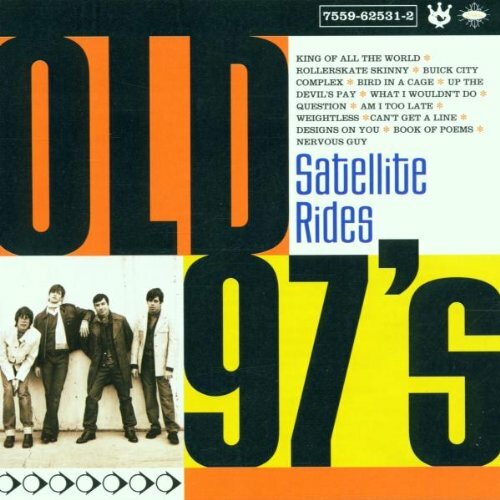 And in fact, I think the best songs on Satellite Rides are probably better than the best songs on Gold or even YHF. Do you wanna mess around? Do you wanna spend the night? Especially a song like “Buick City Complex,” which is essentially one long come-on from a dude whose whole life has been affected by a decision — in this case GM’s decision to close the titular Buick City — that is totally out of his control. So he does the only logical thing: hit on a girl that he might never see again. Where are you gonna move? It’s a weird non-sequitur that still totally works: who hasn’t put off major life decisions for a little messing around? And sometimes that messing around ends up becoming a major life decision in and of itself, which is what Miller is clearly hoping for. Just to see how it will end? With Ken Bethea alternating slide guitars and 12 strings at will, “Buick City Complex” is a bit fuller in the guitar department that a lot of Old 97’s songs, but there isn’t a note or a lick out of place: whether its the extra rhythm slashes on the chorus or the quick whirling solo in the middle, or even the leads during the final two verses, Bethea never misses a trick. As the song progresses, Miller’s character gets more and more animated, and maybe a little bit desperate: “Do you wanna mess around?” he keeps asking her over and over again, but we never find out if she does or doesn’t.